How to do a turn in the road on your driving test in the simplest way possible. The objective of this manoeuvre is to turn the car around using forward and reverse gears to turn the car around in as few turns as possible (normally three). You will also be expected to observe around for other road users. It requires good clutch control and fast controlled steering. Read on for a step-by-step guide to the turn in the road. 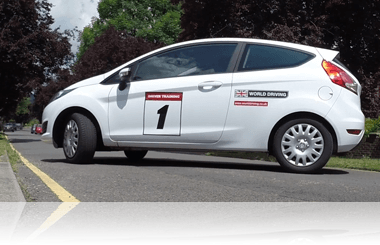 Video tutorial on the turn in the road manoeuvre. Step-by-step guide to the turn in the road. Firstly, is the road you've chosen to do this on safe? You don't want to do this on a busy road where you would cause others to stop. Consider the camber of the road. This allows water to run off the road and down to the drains at the side. It doesn't look much but it will affect you as you carry out the turn. Because of the camber you will firstly be going uphill slightly. Make sure that you're in first gear, have the gas set and essentially the biting point. Make sure that you have checked all around your car, including the blind spot. Once the road is clear, release your handbrake and steer full-lock (maximum) to the right. Drive slowly but steer quickly. You'll be going uphill until you get to the centre of the road and then downhill the other side towards the kerb. Be ready to lower the clutch and brake. Observe continuously as you do the turn in the road. Especially looking out for cyclists and pedestrians. 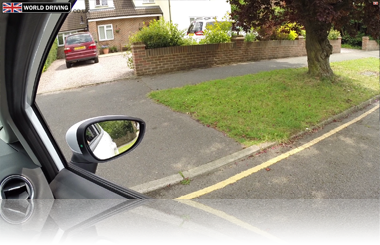 Stop near the kerb if another road user approaches you. Steer a little to the left as you get closer to the kerb. This can help for when you reverse on the next part. You'll know when to stop on the first forward part because the kerb will go under your right-hand door mirror or you could say that the mirror will look like it sits on the pavement (this reference point varies on different cars). Once you've stopped, apply handbrake and change to reverse gear. Make sure that you get the gas and biting point set as you'll be reversing uphill. Observe properly before you reverse, check all around. Check over your left shoulder out the back window just before you release the handbrake to reverse. Stop if any other road user approaches you. Release the handbrake once it's safe. Reverse gear is powerful, so be ready to lower the clutch if it goes too fast and brake if needed. At the same time steer full-lock to the left (maximum). 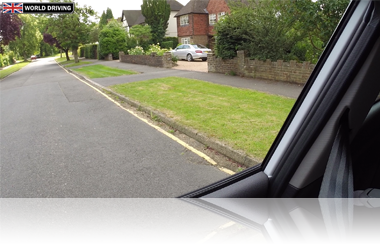 During the turn in the road, observe constantly for other road users, especially out the back window (left shoulder). 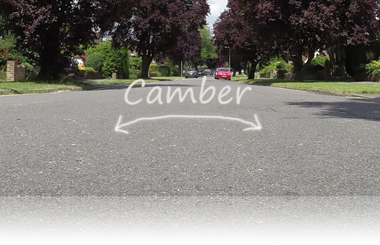 Your car might speed up as you go over the camber (halfway across). As you get closer to the kerb, steer a little to the right. This will get your wheels ready for the final forward part. The kerb will disappear in your right-hand door pillar and that is when you need to stop (reference points can vary slightly in different cars). Change to first gear. Set the gas and biting point. Final observations and once it's safe release the handbrake. Steer full-lock to the right as soon as you move back to your normal driving position. Turn in the road complete. Turn in the road on a hill video. Read about the other driving test manoeuvres here including the 'bay parking', 'parallel parking', 'reversing around a corner' and the 'emergency stop'.